Safe Metalic Free Rubber Crumb that is used as in-fill material in synthetic turf , sports fields, or putting green fringe applications. Used for infill in Sports Turf, Synthetic Lawns, Playground Areas, & Horse Riding Rings. Crumb rubber is a finely ground, powdered rubber produced from whole tires. Our Tire Recycling utilizes both cryogenic and ambient systems to produce 250 million pounds per year of high quality crumb rubber from passenger or all black radial truck tires at four strategically located facilities through out the USA. By reclaiming more than 33 percent of the nation’s discarded tires, means we annually transform more than 110 million tires into raw materials for smart, sustainable products that improve people’s lives. Strict quality control process assures reliability and customer satisfaction in every bag. Our specially designed rubber crumb infill with dust free rubber granules prevent "flyout", "splashing", and migration of the base so that traction, drainage and shock absorption are maximized. Used to provide an in-fill cushion material in synthetic turf to provide additional safety against injuries from falls from athletes & children. Used in Synthetic Sports Turfs & Synthetic Lawns world-wide for many years. We offer the most popular style G1 for most synethetic lawn/fringe applications (See chart below for sieve passing). Particles are about the size of granulated sugar. Most Synthetic Lawn applications require 1-2 lbs per sqyd of G1. 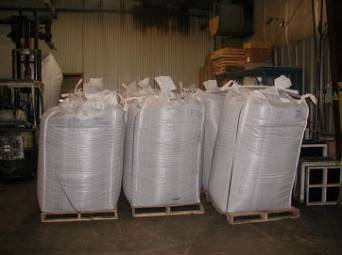 (2000 lb Super Sack will infill 1000-2000 sqft of Synthetic Turf). Same product used in Synthetic Sports Fields World Wide! There is approximately 28 lbs of product per 1 cuft. or 2.5 lbs per 1 square foot x 1" depth. For spreading large amounts of rubber crumb we recomend a commercial Top Dresser machine available at http://www.ecolawnapplicator.com See if there is a local dealer who will rent you a machine or know of a local contractor who can help you. Can be mixed with sand to create a more solid surface. 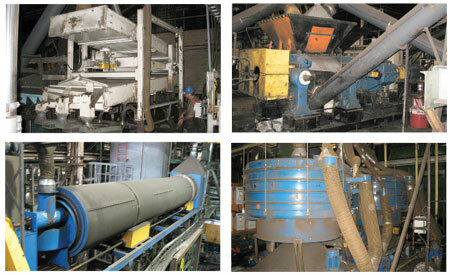 This mixing is done by the end user, We only ship you the rubber crumb. To calculate shipping costs, add a product to the shopping cart. An orange colored "Calculate Shipping" tab will now show up on the right side of your screen in the blue area in the shopping cart section. Click on this "Calculate Shipping" and enter your zip code. Hit "Submit", and your shipping options & delivery times will now be displayed. If there is a choice, pick the option that best fits your needs. Customer/contactor is responsible for providing man-power/equipment to off-load pallet(s) at delivery point unless you request the lift gate service option. Orders to Canada may be slightly more. We will get an exact quote & contact you before processing order. Canadian customers responsible for duties & import taxes. NOTE: The US government has implemented a new “Electronic Log Documentation” (ELD) law that has caused havoc in the transportation industry. Due to this new law, it’s harder to find trucks, deliveries are not delivering on time and prices have gone through the roof. Prices have doubled in some cases. Before processing your order, we will get an exact current price quote for your order and let you know the price. You can then decide to continue or cancel the order. 1) Trucks (availability) and Destination are the top factors. The gas has a FSC (fuel surcharge). I think it is now 26%, but it changes often. The trucks are a large factor being that there is a shortage of trucks on the road and this has been happening for several years. Sometimes we just can not find any trucks to ship, after calling on numerous LTL carriers. 2) Destination (or what I think the trucking business calls “lanes”) are a crucial element in the pricing. The way it is explained to me, truckers do not want to carry a load somewhere that they can not pick up something on return. They want in and out quickly and do not want to wait around. Time is money for them. There are known dead zones that do not hold much promise for return loads. 3) The infrastructure of some states and cities (the condition of the highways). 4) If the delivery address is business or residential, that also plays into the pricing. 5) If you require a special lift-gate to unload your order, there is an additional fee that has to be charged depending upon the size of the load. 6) NOTE: The US government has implemented a new “Electronic Log Documentation” (ELD) law that has caused havoc in the transportation industry. Due to this new law, it’s harder to find trucks, deliveries are not delivering on time and prices have gone through the roof. Prices have doubled in some cases. Before processing your order, we will get an exact current price quote for your order and let you know the price. You can then decide to continue or cancel the order. Will the crumb rubber float away when it rains? No, your crumb rubber in-fill material will not float away when it rains. The high density of crumb rubber will cause it to stay in place. You should contact www.ecolawnapplicator.com to see if they have sold a machine to a rental center or contractor close to you that you can hire or rent the spreader from. If you do not have access to a spreader from Ecolawnapplicator then spreading rubber grinds is best done by hand. It is not possible to use a drop spreader with rubber grinds as it is with most other infill materials. The rubber crumb is too big for most drop spreaders and has a tendency of clogging the spreader. However, due to its characteristics it is much easier to disperse once it is on the turf. To get started, fill your wheelbarrow with the rubber crumb material. Position the wheelbarrow in a needed area, reach in with both hands and grab as much as you can carry. Simply throw the rubber crumb onto the turf until you have the entire area filled. You will want enough infill material to fill in between the fibers without completely covering the tips of the fiber. It is all right if some areas have more infill than others at this point of the process. You will be brushing the infill in with a power broom or stiff bristle broom to even out the rubber grinds. Brooming the rubber grinds is a required step to work the infill down into the fibers of the turf. It also helps disperse the infill and even out the high spots created during the application of the rubber grinds. Using a stiff bristle broom, use short brisk strokes against the grain to work the rubber down into the fibers and to the backing material. Continue brooming until the blades are standing up and you have an even layer of rubber. Use short brisk strokes to work the rubber into the fibers. Continue brooming until the blades are standing upright. The final step of the infill process is wetting down the turf with a garden hose. This helps drop the infill material down into the fibers and to the base. It also helps clean excess dust and debris left behind during the infill process. Simply hose down the area side to side with your garden hose. Make sure to wet down the entire area to ensure all infill materials are settled. Repeat as often as necessary. Q: What materials can be found in the artificial turf crumb rubber? Q: Can people be exposed to the materials found in crumb rubber? Accidentally ingesting small amounts of material by placing fingers in the mouth or not washing hands before eating after playing on the fields. Breathing in dust created from playing on the field or from vapors given off by the turf. Direct skin contact with the crumb rubber. Q: Are there any health concerns related to crumb rubber exposure? A: Several scientific research studies carried out in the United States and Europe have examined the chemical composition of crumb rubber. These studies have assessed the potential exposures and health risks for people using turf fields. Based on these research findings, health risks are unlikely from exposure to the levels of chemicals found in artificial turf. However, there are limitations to these studies and more research is needed. Q: Can people be exposed to these chemicals from other sources? A: Many of the chemicals found in crumb rubber are very common in the urban environment. People can be exposed through normal daily activities including breathing air, eating food, and by getting dirt or dust on their skin. For example, rubber dust is created from the wear and tear of tires on roads and is a source of city air and soil pollution. PAHs come from the exhaust of engines, smoke from fires and cigarettes, dust-containing soot, urban soil and char-broiled foods. Gasoline, paint, building materials, trees and many other sources release VOCs into the air. See the myths associated with crumb rubber, and compare them against the facts. "CLICK HERE"
COMPLETED Posting: Modification to the Tires Website see: Health and Environmental Concerns, http://www.epa.gov/epawaste/conserve/materials/tires/health.htm. There have been concerns about the health implications of the use of recycled tire crumb in playgrounds and in synthetic turf athletic fields. In response to these concerns, EPA conducted a Scoping-Level Field Monitoring Study of Synthetic Turf Fields and Playgrounds. The final report was issued in 2009 and concluded that on average, concentrations of components monitored in this study were below levels of concern. To supplement this study’s limited data, EPA met with state and local representatives in 2010 to review other available field monitoring studies including a 2010 study conducted by the state of Connecticut which concluded that exposures and risks were not elevated (relative to what is commonly found in outdoor air) for either children or adults using the fields. A 2010 report (PDF) (13 pp, 238.24 K) by the California Department of Resources Recycling and Recovery examined the possible human health risks of outdoor athletic fields made from artificial turf containing recycled crumb rubber with respect to skin abrasions, bacteria harbored by the turf, inhalable particulate matter, and volatile organic compounds. The report concluded these fields do not pose a serious public health concern, with the possible exception of an increased skin abrasion rate on artificial turf relative to natural turf. At this point, EPA does not believe that the field monitoring data collected provides evidence of an elevated health risk resulting from the use of recycled tire crumb in playgrounds or in synthetic turf athletic fields. Ultimately, the use of recycled tire crumb or any other playground materials is a state and local decision. 8/7/2018 – I have a sports turf section at my school that is 150' x 15'. How much infill do I need? Do you ship to Illinois? 3/4/2018 – Can you please send me a pic of the rubber crumb product in the different sizes and colors you have? 8/31/2017 – Did you receive any feedback from the people with the 8,640 sq ft dog agility field? I am in the same position so would like . . .
Is it possible to get a freezer bag sample of the synthetic turf infill product. 4/29/2016 – I'm building a new home. It's shaped in something similar to a large U. In the middle of the U will be my courtyard and pool. . . .